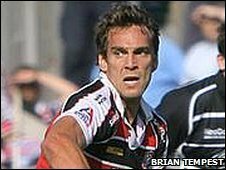 Championship side Cornish Pirates have confirmed that 14 of their players are to leave the club, including Bertrand Bedes, Mike Burak and Ed Fairhurst. Iva Motusaga and Marika Vakacegu's departures had already been confirmed. The Pirates have also announced the arrival of 10 new signings, including Coventry prop Rudi Brits and Yokogawa Musashino Atlastars' Jonny Bentley. Brits' Coventry team-mates Carl Rimmer and Laurie McGlone will also join the former National One side. Darren Dawidiuk (to Gloucester), Nicky Griffiths (to Doncaster Knights), Marika Vakacegu (to Sale Sharks), Bertrand Bedes (to Bristol). Others (but clubs not confirmed) Mike Burak, Peter Cook, Ed Fairhurst, Sam Heard, Iva Motusaga, Dan Seal, Heino Senekal, Brian Tuohy, Simon Whatling and Adryan Winnan. Jonny Bentley (from Yokogawa Musashino Atlastars), Rudi Brits (from Coventry), Luke Collins (from Redruth), Gavin Cattle (from Llanelli Scarlets), Wes Davies (from Doncaster Knights), James Doherty (from Wharfedale), Laurie McGlone (from Coventry), Mike Myerscough (from Launceston), Carl Rimmer (from Coventry) and Ryan Storer (from Worthing). Paul Andrew, Sam Betty, Richard Bright, Blair Cowan, Paul Devlin, Rob Elloway, Matt Evans, Scott Franklin, Ben Gulliver, Aisea Havili, Mark Ireland, Rhys Jones, Tom Luke, Rhodri McAtee, Jimmy Moore, Chris Morgan, Alan Paver and Steve Winn.